Two of my spring favorites are pictured here. Picked last week from just behind the greenhouse by the gate, these daffodils fully opened just yesterday. 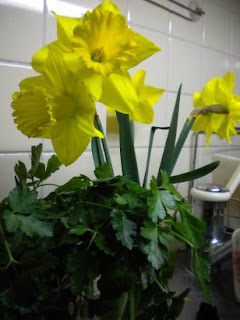 My favorite spouse plunked the parsley (overwintered nicely, by the way) from the balcony garden in a jar next to them, and like magic, Spring came to the kitchen sink. Doing dishes is almost a pleasant chore now.